05 type of SX-6000 series, based on quality-proven authentic series UX60/70/75 & SX330, are now reborn as new generation ECRs in new stylish cabinet for Retail(Scanning) Market. With max. 61,693 PLUs, a new function 'Customer File' (with name,address, phone#, etc. 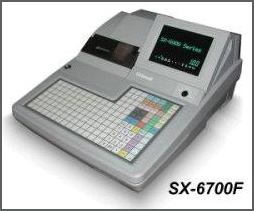 ), complete discount functions and linkage to scale & scanner(etc), SX-6000 series 05 type fits wide range of industries, such as Grocery, Convenient Stores, Mini-Supermarkets, etc.